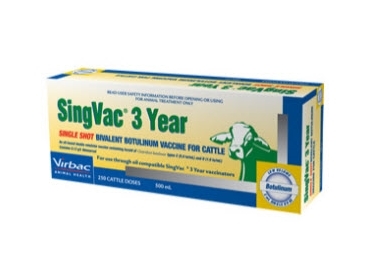 Virbac Animal Health offers a full range of cattle vaccinations, including Singvac 3, a single shot, three year bivalent botulinum vaccine. The single shot vaccine works to prevent botulism caused by Clostridium botulinum. It is an oil based emulsion vaccine with type C and D Clostridium botulinum toxoids. A single dose of the vaccine is sufficient keep cattle that are being vaccinated for the first time fully protected for at least three years. A second, booster dose is not required until 36 months after the initial vaccination. It is important to note that in non endemic areas, where infection is rare, annual vaccination is recommended as a 36 month booster interval may not provide optimal protection. The botulism vaccine can be administered to dairy, beef and ESI cattle with zero withholding periods. The vaccine is available in 200ml and 500ml sizes and should be refrigerated between 2°C and 8°C, never frozen. Visit the Virbac Animal health website for more information on the 3 year, Singvac 3, vaccine for all cattle and other similar products.